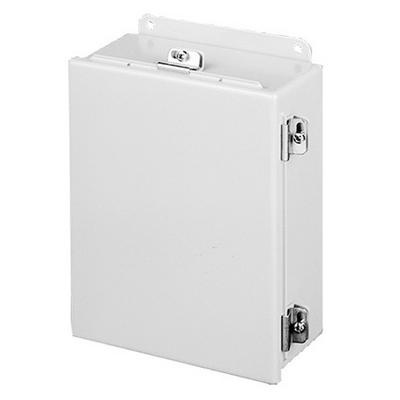 Hoffman 1-Door continuous hinge enclosure with clamps, features 16-gauge steel construction for longer endurance. This ANSI 61 gray enclosure featuring polyester powder paint finish offers immense resistance against impact, moisture, abrasions, corrosion, chemicals, weather, scratches and UV rays. It measures 6-Inch x 8-Inch x 3.5-Inch. External wall mounting brackets of enclosure aids for easy installation. It includes weld nuts for mounting optional panels and terminal blocks. This NEMA 4 enclosure offers environmental protection and security in indoor or outdoor applications. Enclosure is UL/cUL listed, CSA certified and meets IEC standards.